Here's an exciting Susan B Dollar $1 that was Mint Cancelled and turned into a Waffle coin at the US mint. This is the first time in US mint history that the mint ever cancelled coins. Mint Canceling is a new process the mint is now using to keep error coins from getting out into circulation. There was only one release of these Mint Cancelled coins from the mint made available for the public, and once this release is gone, these coins will not be available again. 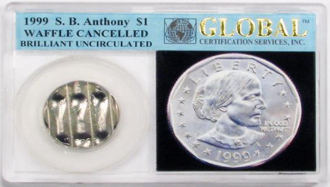 Don't miss out on this Mint Cancelled Susan B Dollar $1 US coin in a Global Certification Services holder. The Global holder tells the story on the back of why coins were cancelled at the US Mint. Pictures are stock photos.